It's normal for your feet to hurt a bit the morning after a vigorous workout. However, if foot pain is a common thing for you after exercise, there may be a problem. A proper diagnosis from a podiatrist is essential to prevent further damage or injury and to help you get fit pain-free. Most often, pain in your feet upon first standing in the morning, especially after exercising the day before, is caused by plantar fasciitis. This condition causes inflammation in the plantar fascia, a band of tissue that attaches the ball of the foot to the heel. It provides support to the arch and prevents your feet from falling flat or rolling inward. If there is a problem with the plantar fascia, you will likely suffer from sore feet every morning. The condition of plantar fasciitis can be identified as a kind of periostitis, or an inflammation of the lining of your bones. When the plantar fascia is overexerted, stretched or irritated through exercise, it can pull on the lining of the bones in your feet. Overnight, your body tries to heal this area by reattaching the lining to your bones. That's why when you get out of bed in the morning it hurts so much when you first take a step. The lining is pulled away again, causing a sharp pain in the arch of the foot. To prevent this pain, ice your feet after exercising and massage your feet and calves before getting out of bed. In some cases, your plantar fasciitis may be caused by muscle tightness. If your calf or Achilles tendon is too tight, it could weaken the muscles in the arch of your foot, causing the plantar fascia to be overworked. 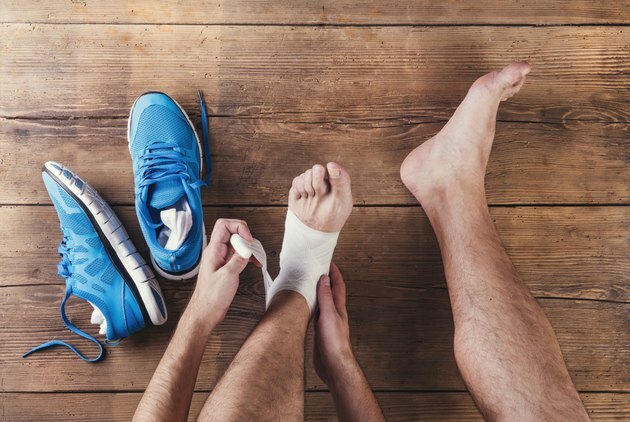 To prevent this from happening, don't increase the duration of your workout drastically and always stretch and massage your calves, Achilles tendon and foot arches before and after exercise and before getting out of bed. Sore feet in the morning could also be the result of improper footwear when you work out. Wearing sneakers that don't have arch support could lead to the over-stretching of the plantar fascia and significant pain. Along with massage, stretches and rest, wear shoes designed for exercise with arch support, heel cushioning and proper padding. This will help you land on your feet properly while exercising and can prevent further damage to the plantar fascia.